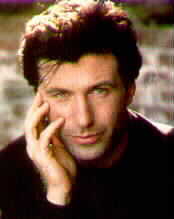 Welcome to Unofficial Alec Baldwin Page! Alec is my favorite Baldwin and one of my favorite actors. As far as I know this is only site dedicated to Alec. I first saw him in Working Girl. But I didn't even know his name then. Then I noticed him in The Hunt for Red October which I didn't like much the first time I saw it. The movie which made me like Alec was The Marrying Man. After that movie, I liked every movie he was in except maybe The Shadow. My two favorite movies of Alec are Miami Blues and Prelude to A Kiss. Enough said. Enjoy the site. Alec as The Center of Universe (Or at least, Hollywood). These sites included Alec Baldwin Homepage on their actors list. So, I'm returning the favor. Go to Homepage (a little info about me). Surfing the Net (Some Things to do on the Internet). If you have any suggestions, please contact me at [email protected]. I will try to answer ASAP.